The truth is, this observation about the future based on present weather patterns originated long before William Shakespeare. Jesus Himself quoted this proverb about the weather to the Pharisees and Sadducees, but He did so in order to make a very important point to them (and to us). They demanded that Jesus show them some miraculous sign, or miracle, to prove His claims of divine authority. His reply to them: “When it is evening you say, ‘It will be fair weather, for the sky is red’; and in the morning, ‘It will be foul weather today, for the sky is red and threatening.’ Hypocrites! You know how to discern the face of the sky, but you cannot discern the signs of the times” (Matthew 16:2-3, emphasis added). In other words, the signs they were seeking were right in front of them. They could interpret the weather but they couldn’t interpret what God was doing plainly in their midst—for example, the miracles Jesus had been doing almost daily. Did you ever wonder where that expression, “the signs of the times,” came from? It came from Jesus! And His warning to the religious leaders of His day is just as relevant today as it was back then. The future is unfolding all around us. The question is, Are we wise enough and discerning enough to see the signs of the times? If sailors and farmers adjusted their plans based on the weather, how much more should we incorporate the signs of the times into our lives? The religious leaders weren’t the only ones who asked Jesus for a sign. The disciples asked Jesus what sign they should look for indicating His return and the end of the age (Matthew 24:3). His answer, part of the lengthy Olivet Discourse, contained many signs and clues—but I want to focus on one: the sign of the days of Noah. Jesus told the disciples that, in spite of the signs He gave them, “of that day and hour no one knows, not even the angels of heaven, but My Father only” (Matthew 24:36). In other words, the signs of His coming would be general, not specific, as to time and date. (Just like the red sky at dawn or dusk—a general indicator.) But in spite of being general, they would be revealing enough for those with discernment to see them as signs of the time of His return and the end of the age. So, what is the sign of the days of Noah? Jesus described the sign of the days of Noah in Matthew 24:37-39. Regarding His return and the end of the age He said, “But as the days of Noah were, so also will the coming of the Son of Man be.” And how should we interpret that sign today? And more importantly, how should it impact the way we live? The sign of the days of Noah has a past, present, and future application. Jesus was talking specifically about “the days before the flood” (verse 38). Something about how people were living in the days preceding the Flood would be a sign for the generation living in the days before Jesus’ return to earth. The obvious question is, how were people living in the days before the Flood? Let’s look more closely at the days before the Flood swept over the earth. This wasn’t a human population innocently multiplying and filling the earth as God had commanded (Genesis 1:28). Instead, “Then the Lord saw that the wickedness of man was great in the earth, and that every intent of the thoughts of his heart was only evil continually” (Genesis 6:5). In other words, humanity was ignoring God and living only for themselves. “The earth also was corrupt before God, and the earth was filled with violence. . . . for all flesh had corrupted their way on the earth” (Genesis 6:11-12). So why did Jesus use such innocent sounding words to describe the days of Noah—eating, drinking, marrying? Because it’s a sign—an illustration of mankind’s total absorption in their own affairs, their own interests, their own pleasures. It’s an image of carnality as opposed to spirituality; it’s an image of self-centeredness instead of God-centeredness. The sinfulness of that generation brought about God’s judgment—but the people in the days of Noah were blind. They were blind to their sin, to God’s righteousness, and to the way of escape God was providing: Noah was building an ark, but nobody took him seriously. It was not “until the flood came and took them all away” (Matthew 24:39) that their eyes were opened. And Jesus said, “So also will the coming of the Son of Man be” (verse 39). Allow me to paraphrase the sign of the days of Noah: Before the return of Christ and the end of the age, humanity will be increasingly self-centered and self-focused, thinking only of pleasurable pursuits and ignoring the plan of God. As in the days of Noah, only when “the flood” comes—the return of Christ as judge—will their eyes be opened. There is something different about our day compared to Noah’s day: the Church of Jesus Christ. Genesis tells us that God spared only one righteous man on earth, Noah (and his family), to save. But today, there are tens of millions of redeemed followers of Jesus who are looking for His return. So the sign of the days of Noah doesn’t mean we will all fall away—that the whole earth will be filled with wickedness. Instead, it means that the part of humanity that is not God-focused today will be increasingly that way the closer we are to Jesus’ Second Coming. That is the sign of the times we need to be looking for. But here is the question: Even if Christians are not taken by the flood of Christ’s judgment when He appears, will we see His appearance approaching? Will we recognize the increasingly visible sign of the days of Noah? You’ve heard the illustration of the fish, how they don’t know what “dry” means because they’ve been in the water all their life. “Wet” is all they know. There is a similar danger for us as Christians. We live in a self-absorbed world. Self-centeredness and the pursuit of pleasure (and yes, wickedness) are all around us. It is possible that we, as in Noah’s day, might consider the “things of this world” as normal instead of recognizing them for what they are: signs of God’s coming judgment. Some signs are sensational, but others are subtle—like apathy, confusion, doubt, indifference, hate, immorality, evil, carnality, disrespect, sensuality, and more. Do we see these signs in our present generation? Do we see these signs increasing and becoming more commonplace? My answer to both questions is “Yes.” When I see them, I need not only to grieve over them but also to see them for what they are: signs of lawlessness that mean “the love of many will [have grown] cold” (Matthew 24:12). How then should we live? This issue of Turning Points will help answer that question. By the time you reach the fourth article, you will be ready to identify action steps you can take to keep yourself and others focused on the signs of the times—the signs that help us know we grow daily closer to the glorious appearing of our Lord and Savior, Jesus Christ. 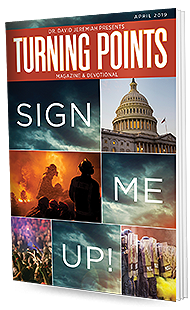 Request your subscription to Turning Points magazine today! This article was first published in Turning Points Magazine & Devotional. Learn more about the magazine and request your free copies today!